Unsurprisingly, a representative from New York ACORN, Forest City Ratner's partner on the Atlantic Yards project, came to the Empire State Development Corporation (ESDC) board meeting on Thursday to urge the board to approve project changes. And unsurprisingly, that representative delivered remarks that could've been made four or five years ago--as if nothing had changed with the project, no doubts had been raised about the developer's commitment to affordable housing, and no doubts had been raised about whether the announced ten-year timeline is realistic. Well, ACORN, according to the May 2005 Housing Memorandum of Understanding, agreed to "take reasonable steps to publicly support the project by, among other things, appearing with the developer before the Public Parties, community organizations, and the media. So that's why Pat Boone, president of New York state ACORN, was speaking. Her boilerplate support deserves closer analysis. Thank you for allowing me to speak. My name is Pat Boone, I'm president of New York State ACORN, but I was born and bred in Brooklyn, New York, in fact, Downtown Brooklyn on Bergen between Third and Fourth Avenue. I was baptized at Bethel Baptist, that is still on Bergen Street between Third and Nevins. I am emotionally invested as well as here representing hundreds of people who live and need apartments here in New York City. Boone then began to read a statement she likely hadn't practiced all that much. New York ACORN is the largest grassroots community organization representing thousands of low-income families in New York's lowest-income communities. For years, we have watched vital resources such as money and land go towards creating housing that New York's working poor under the philosophy that too much low-income housing would continue the deterioration of these communities. 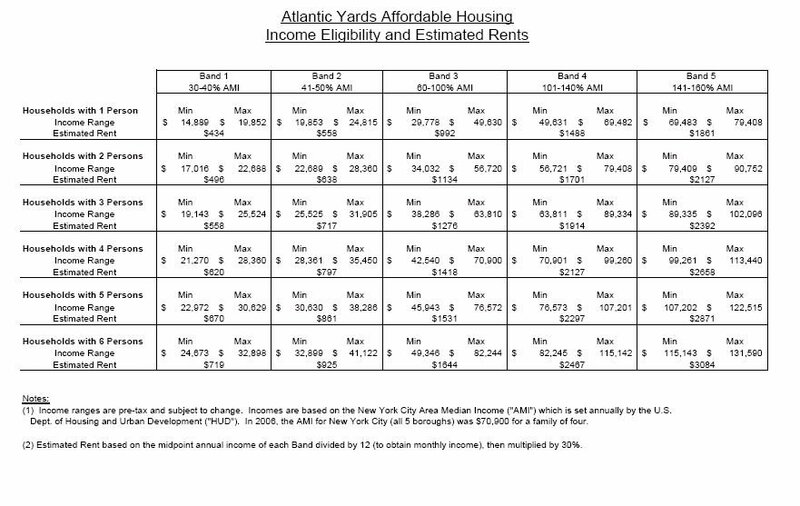 Note that, while ACORN may represent low-income people, only 900 of the 2250 subsidized units in the Atlantic Yards plan are designated for low-income households. When ACORN canvassed its members regarding their support for a project that would "set aside at least half the units for affordable housing," the possibility of adding market-rate condos was not broached. Now 1930 have been added to the AY plan, and Forest City Ratner now claims it promised a 50/50 plan regarding only rental units. In other words, ACORN's vaunted 50/50 plan is actually a 35% plan. And 900 of 6430 units would mean 14% income units. Now, that so many of these resources have been drained away from New York's needy, we see the crisis of affordable housing growing, not declining. Actually, given the economic downturn in the past year, housing has become somewhat more affordable, at least for for the moderate and middle-income families eligible for perhaps half of the subsidized units. This is no surprise. As a process of building housing for high income residents in low-income communities has increased the values , the cost of renting to low-, moderate-, and middle-income families are now much worse than ever before. She managed to conflate the different challenges faced by low-income households and others seeking subsidized housing. We believe the most critical need facing Brooklyn is the need for increased numbers of affordable housing. Forest City Ratner Companies has made a commitment to build housing that is truly affordable. What commitment is there? It depends on the availability of housing subsidies. That means that if Atlantic Yards is allowed to go forward, it will be remembered because we are breaking new ground. Not just new ground for an arena to bring sports and basketball, which would be greatly appreciated, but new ground because they are building 4500 rental units of mixed-income housing in a way that actually allows people of mixed incomes to live together. It's unusual for ACORN to have praised the arena. It also will be remembered for ACORN's willingness to engage in a privately negotiated affordable housing deal, agreeing on behalf of the community, in exchange for FCR's housing pledge, to trade off density and other impacts. That means white people and black people, Latinos and Asians, all of the ethnicities that make up Brooklyn, young people and seniors. It means low-income and wealthy, and working families, the cops and fireman and teachers. The people who keep our city alive and moving. This is truly exciting. It is exciting because Bruce Ratner is not going the ordinary 80-20 route and building a lot of luxury apartments for people who hang out in luxury skyboxes. Well, that ordinary 80-20 route is working fine for Ratner at 80 DeKalb Avenue. He's committed to doing 50 percent of the housing, 2250 rental units, the way they should be built, for all the community, not just for some. 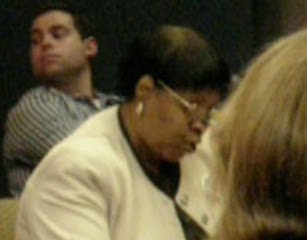 Boone has managed to suggest that ACORN speaks for all those who'd be seeking the affordable housing. But many people attending a July 2006 affordable housing information session thought the upper bands of subsidized units would be far too expensive for them. It is for all these reasons that I am here today to urge you to accept the modifications of the General Project Plan and vote the project forward. Brooklyn, the city, and state definitely need the affordable housing, jobs, and economic boost Atlantic Yards will provide. Of course ACORN hasn't looked into the claimed economic boost. 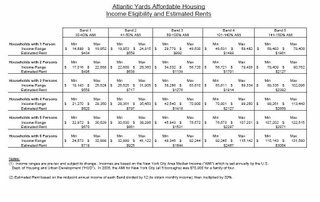 We need Atlantic Yards and need it now. We all need it, and not just those who want to remain in the same status quo that is going on down here. That dig at project opponents doesn't acknowledge that they've produced their own plan for the Vanderbilt Yard, the UNITY Plan. We want improvement and we want everybody to afford--and be able to live the way we were all promised to live in this United States of America, equitably. Thank you, very much. While the project that was supposed to deliver affordable units in ten years, Atlantic Yards more likely would take "decades," according to the former ESDC CEO. And, as noted, the affordable housing is not guaranteed. Meanwhile, at the meeting, the ESDC board agreed to speed $40 million in city and state funding to the developer, "to achieve the goal of closing on the initial phase of the Project by the end of the calendar year," according to board materials. Maybe why the man pictured--[updated] Forest City executive Michael Rapfogel--stopped paying attention to Boone's speech. It was all in the bag. Everybody knows.